Sapphire is mined from alluvial deposits or from primary underground work. Commercial mining locations for sapphires and rubies include (but are not limited to) the following countries: Afghanistan, Australia, Myanmar / Burma, Cambodia, China, Colombia, India, Kenya, Laos, Madagascar, Malawi, Nepal, Nigeria, Pakistan, Sri Lanka, Tajikistan, Tanzania, Thailand, the United States and Vietnam. Sapphire from different geographical locations may have different appearance or chemical impurity concentration, and tend to contain various types of microscopic inclusions. Therefore, sapphire mines can be divided into three broad categories: classic metamorphic, non-classical or magmatic metamorphic, and classical magmatic. Sapphire from certain locations, or certain categories, may be more commercially attractive than others, especially classic metamorphic sapphires from Kashmir, Burma, or Sri Lanka that have not yet been subjected to heat treatment (Heated). Sapphire is found in igneous and metamorphic rocks. When sapphires are rooted in solid rock, they are considered "major deposits." However, sapphires are often found some distance from the original source. The erosion process moves rock fragments into the river where they crack, releasing the gems they contain from the heavy travel downstream in the river and into "secondary deposits" or "alluvial deposits". Stones exposed to the surface of the earth endlessly hit by wind and water. The erosion process moves rock fragments into the flow where they crack, releasing the gems they contain. In places where current is waving, heavy fat stones enter the river or bed. Over time, sapphires become concentrated and the site becomes a secondary type of deposit called "alluvial deposits". Alluvial gem gravel is the most beneficial source of sapphire because it contains a number of concentrated gemstones which are relatively easy to extract. The principles of alluvial mining are the same throughout the world; Only the level of mechanization differs from place to place. Primitive alluvial mining requires nothing but pots, filters or baskets. Many people consider Sri Lankan sapphires among the best in the world. Various colored sapphires can be found here, including rare padparadschas. About 90 percent of the star sapphires in the world also come from this island. Sapphire from Sri Lanka is known for its high clarity. Sri Lanka Sapphire comes from a vast gravel deposit located in the southern two thirds of the island. The mining method is relatively primitive and if gravel is extracted from the river at this time, it is done by hand scraper. On land, miners usually use simple non-mechanical equipment, including picks, shovels, shovels and baskets. When the shaft sinks to reach the gravel, they are reinforced with palm and bamboo scaffolding and pumped to keep the water level down. The Sri Lankan government has also started several large-scale surface mining operations. At that location, the bulldozer erodes overburden, but the gem pebbles are still washed by hand. Although Myanmar, formerly known as Burma, is a well-known source of some of the best rubies in the world, few realize that it also produces fine sapphires. Tanzania has a wealth of gems from the geological feature known as Mozambique Orogenic Belt, which contains one of the richest gemstones on earth. The belt runs north-south through the eastern part of the country and covers 300 kilometers. The rocks in this mountain belt have experienced significant tectonism and metamorphosis, which has created many gemstones, including sapphires. The majority of sapphires from Tanzania are found in three locations: the Umba River Valley in the north, and Tunduru and Songea in the South. It is fair to say that the Sapphire of Kashmir sets a standard in which all other blue sapphires are valued. Safir Kashmir is expensive and very rare due to the lack of new discoveries in the area, they are known as blue violet and very saturated "velvet" transparency, which is caused by the presence of silk. Kashmir is an ancient term for what is now the territory of Pakistan. 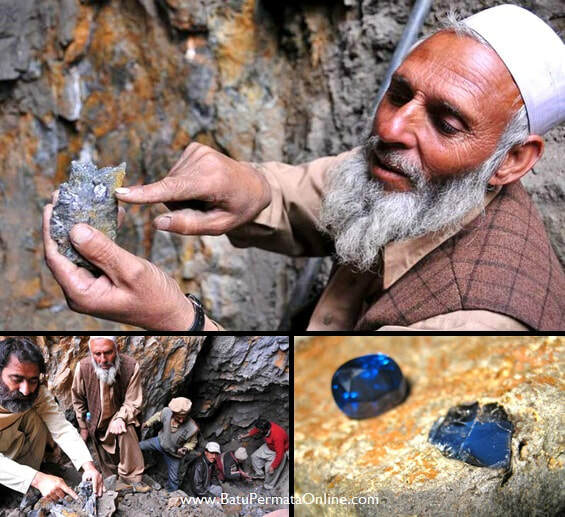 Kashmir Safirs were initially discovered when landslides revealed large blue crystals, which were collected and traded by local residents. From 1882-1887, the site was mined extensively, and according to admirers, the wood produced crystals "the size of eggplants" and "bigger than polo balls or helipads." In 1887 or 1888, the mine was used up.